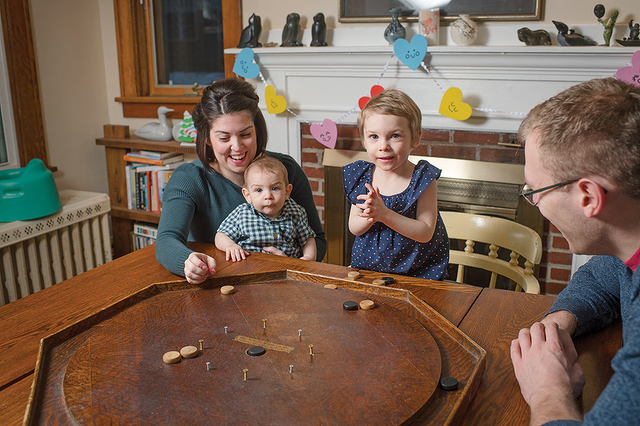 (Photo by Darren Andrew Weimert) Brianne and Blair Evans play crokinole with their son, Ellis, and daughter, Aubrey, a Four Diamonds child. Lizzy DeMarshall, THON's family relations director, with Denni, a Four Diamonds child, at Harvest Day in September. That simple phrase permeates almost every aspect of Penn State’s THON. You’ll see it on t-shirts and posters, you’ll hear it in the annual line dance lyrics, and you’ll find it abbreviated as ‘FTK’ in just about all THON-related correspondence. Those three little words are so important to the largest student-run philanthropy in the world that the organization has trademarked them. “The Kids” are the Four Diamonds pediatric cancer patients at Penn State Children’s Hospital in Hershey, and they are at the core of THON’s mission to provide emotional and financial support and to enhance the lives of children and families impacted by childhood cancer. The financial support aspect has been well publicized, and rightfully so, because the $157 million raised by THON since 1977 has had an enormous impact on past, present, and future cancer patients by paying for research, specialty care providers, and the cost of treatment-related expenses that Four Diamonds families incur. The emotional support element may not be as well-documented or as easy to quantify, but it is just as vital to THON's purpose – and the family relations committee exists to help the entire THON community uphold that responsibility. Blair and Brianne Evans of State College were connected with the family relations committee after their daughter, Aubrey, was diagnosed with Wilms tumor, a form of kidney cancer, in January 2018, just before her second birthday. Following surgery to remove the affected kidney, she finished chemotherapy treatments in August and is now in remission. When they were ready, the social worker put them in touch with senior Amber Shojaie, one of two “new family contacts” on the family relations committee. “My role is to welcome these families into a whole new support system that they didn’t even know they had,” Shojaie says. The 23-member committee facilitates this support system in several ways: by pairing families with student organizations through its “adopt-a-family” program; by holding THON-related events all year long; and by offering special opportunities for families during THON weekend in February. The adopt-a-family program has paired more than 300 families with all kinds of student organizations, including fraternities and sororities, general interest groups, club sports teams, and others, DeMarshall says. The groups develop relationships with their assigned families and stay in touch throughout the year. Many of these relationships last for years, she says. The Arnold Air Society organization has the longest standing pairing, DeMarshall says. Now a senior, it was DeMarshall’s freshman-year experience as a member of Club Cross Country that sparked her passion for THON and family relations. The Evans family – who welcomed Aubrey’s baby brother, Ellis, in July – have been paired with the Penn State cheerleaders through this program. Blair says cheerleaders have visited them at home, and Aubrey loves to track them down at various sporting events. Aubrey now considers the cheerleaders and the Nittany Lion mascot to be her friends, and she likes to wear her very own Penn State cheerleading outfit – “I have shakers!” she exclaims. The first THON-related event the Evans family attended was the State College Mini-THON. Mini-THONs are modeled after Penn State’s THON and are held by high school and middle school students throughout the state to raise money for Four Diamonds. They’re just one example of official year-round events that the families can attend. The family relations committee plans a Harvest Day event in early September, complete with hayrides and a corn maze at a farm near Hershey. “It’s one of the best days. It’s a chance for the family relations committee to meet all the families and to kick off the year, and to get the families together to meet each other,” DeMarshall says. 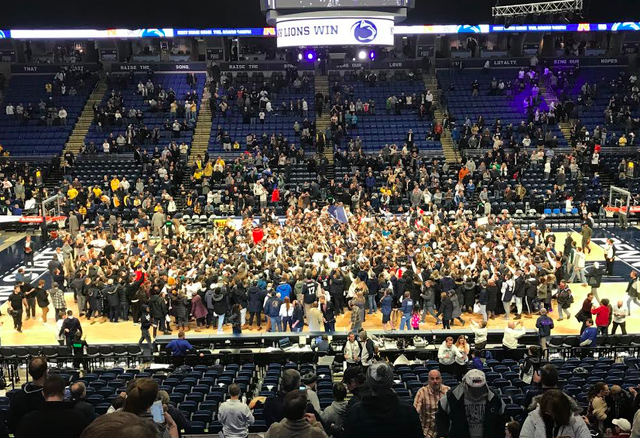 Other special events include a THON 5K at University Park in the fall, a “100 Days ’Til THON” event in Hershey for families who are not able to leave the hospital, and a huge carnival in the White Building at Penn State in December. In addition, most of the Penn State athletic teams host THON-themed games during their seasons, when proceeds from tickets sales may go toward THON and when the Four Diamonds kids are often invited to run out onto the field or court with the teams and to interact with them in other ways. Of course, the main event is THON weekend at the Bryce Jordan Center, which will take place February 15-17 this year. The family relations committee works hard to make the families feel comfortable and to keep them entertained during the 46-hour event. They are welcomed onto the event floor, where they interact with the dancers, offering them another opportunity to bond with members of their assigned organizations. They also can participate in a kids’ talent show and a fashion show on stage during the weekend. For a fun change of scenery, family relations also plans adventures outside of the BJC for the kids during the weekend as part of THON’s Explorers program. Families can choose from 16 different activities, including horseback riding, visiting a firehouse, creating music in a recording studio, and hanging out with Penn State football players in the Lasch Building. Back inside the arena, families can relax in the family lounge or visit the lively kids’ lounge to release some energy when they’re not interacting with dancers on the event floor. A “family feature” hallway on the floor level is papered with handmade posters about each THON family. “That’s a really cool way to honor the families, and it also helps the dancers when they’re at a low point to be able to walk through the hallway and read about these families and remember why they’re there,” DeMarshall says. A big dose of that inspiration comes from Family Hour, which takes place during the final four hours of THON. Three families address the crowd to tell them about their experiences with Four Diamonds. This will be the Evans family’s first visit to THON, but they say they’ve already benefited from their involvement with the organization as a whole. “It’s been amazing. One benefit has been getting connected with other families,” Evans says. “For us, our families live far away, and in the post-treatment period you don’t always have tons of support. 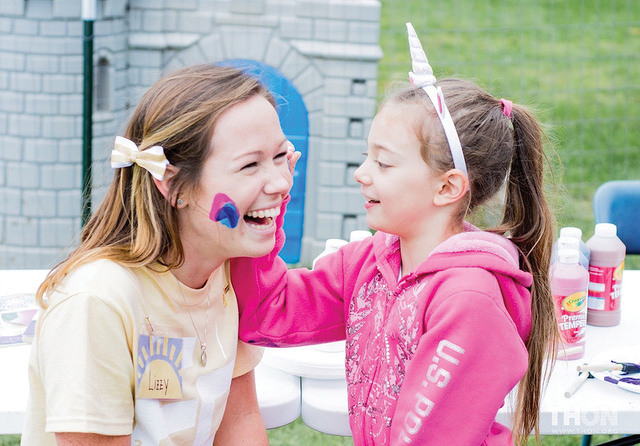 But through THON, you get connected to other families through events, and you get that support because everyone is a cancer family. According to DeMarshall, the feeling is mutual. Karen Walker is a freelance writer in State College who participated in THON as a Penn State student. Lamar Stevens might be one of the most interesting athletes Penn State has on campus. He is the best player on a Big Ten team that has won two games against conference foes in 13 attempts. The season is — from the standpoint of accomplishments — over, and has been for a long time.